Other than doodling at the quilt show, I had not tried to free-hand quilt on a longarm until now. After Johellen Geoge quilted Navigating to Pluto for me, I expressed an interest in giving longarming a try and she agreed to show me the ropes on her Innova Quilting Machine. I took a little over a yard of two different fabrics and basically quilted a wholecloth baby quilt. I mostly quilted wavy lines back and forth but I did throw in a few leaves. It took practice to stop, make a sharp point and reverse to create the vein in the leaf. I also tried some waves like Johellen quilted on my quilt. Those were a little challenging also. This is one of the better ones. And then there were loops. It was difinitely easier for me to quilt from left to right as if I was writing. The top and bottom loops in the below picture were quilted from left to right. The loop on the far right was quilted right to left. I was able to go into the loop nicely, but coming back out was a different story. Here's two more loops going from right to left which are not so smooth. And there's one going left to right which is pretty good. 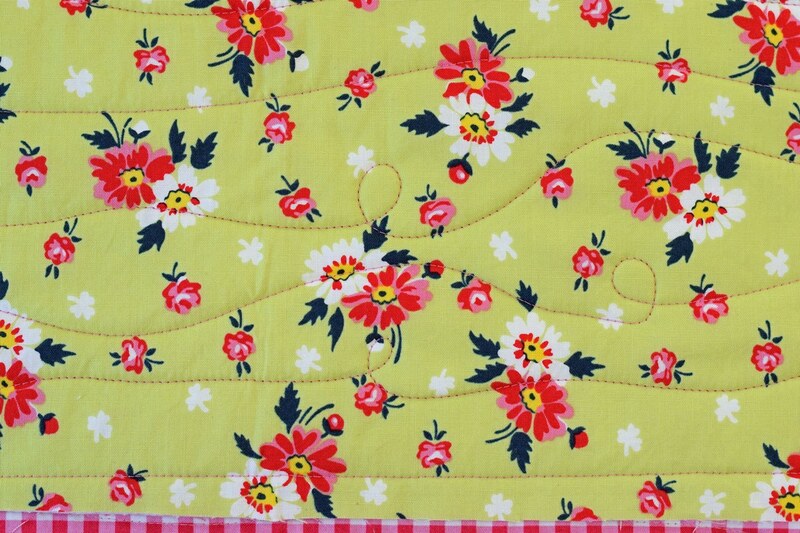 It's much like quilting on a domestic machine...it takes practice! 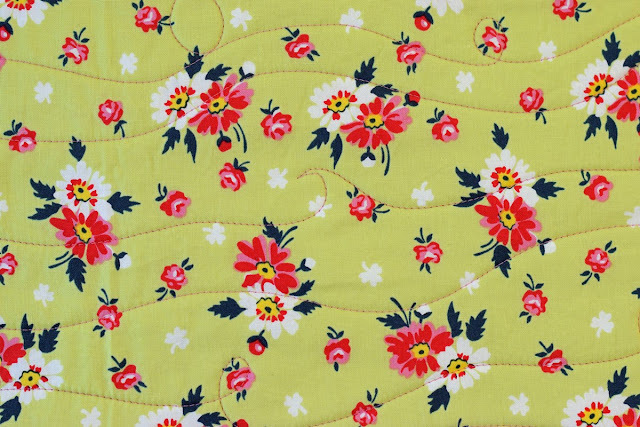 The floral fabric is a Denyse Schmidt print for Fabric Traditions I found on clearance at JoAnn's. The backing is Grand Revival from Darla by Tanya Whedan for FreeSpirit Fabrics. I'm going to bind it in the pink gingham and cut the strips on the bias. 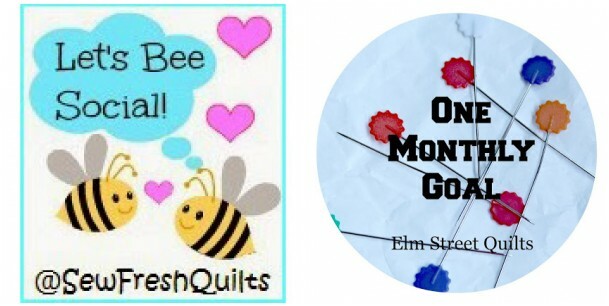 Wanting to make a quilt for a charity project for my local traditional guild, I'm going to make binding on this wholecloth quilt as my One Montly Goal for December, linking with Patty at Elm Street Quilts. And I'll be linking to Let's Bee Social at Sew Fresh Quilts with Lorna. And will we see you making a big purchase sometime soon? I have 2 friends who have Innova machines, and they both like them so much. 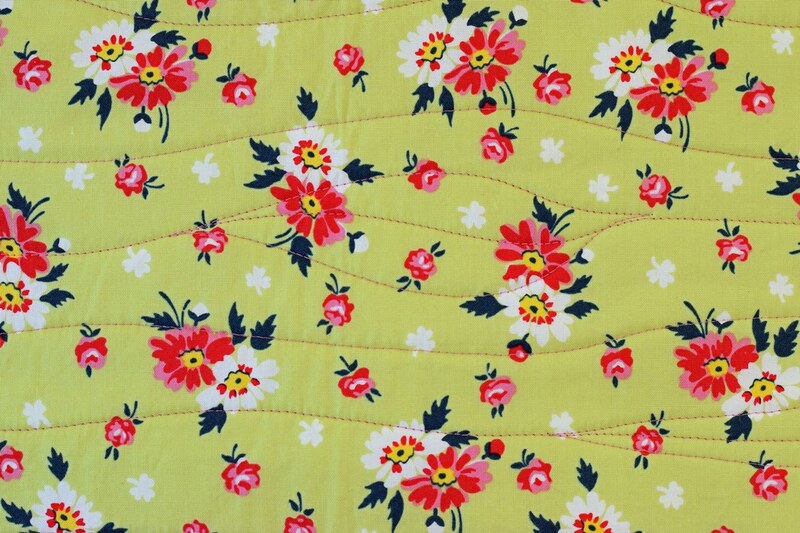 Love the loops, the leaves, and I can understand how it is easier to go from L to R. Lovely fabric . Sounds like you had great fun on the longarm, and I'm sure your skill on your domestic machine stood you in good stead, it looks good to me. Great to try new things ! I have a Sweet 16, whihc i really like! There's a dealer in Franklin NC and Gaffney SC. It is wonderful to have a mid arm for larger quilts. Your blog is terrific! I wish I could join you at Quiltcon but I'm afraid it's too far away! 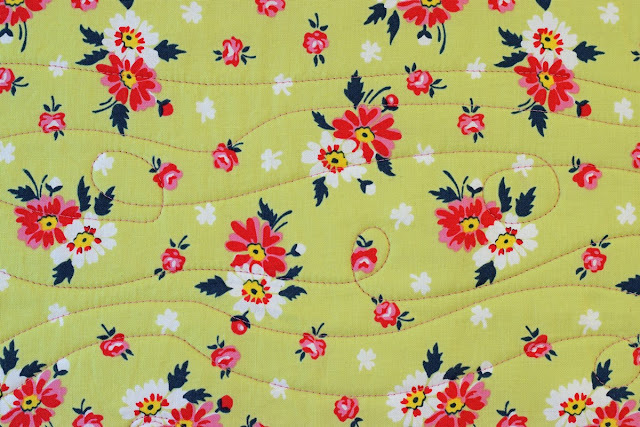 Very cute whole cloth, your first longarm quilting looks awesome! you seem to be a natural at this. very nice job. your quilts are beautiful. Your practice piece looks fantastic, Paige! What a great idea for charity quilts. Looking forward to seeing this bound in the pink gingham!